While we attempt to display current and accurate data, this listing may not reflect the most recent transactions or may contain occasional data entry errors. Marine Connection makes no warranties, express or implied, regarding the content or availability of the products described herein. All inventory listed is subject to availability and prior sale. Please consult selling agent for details. Prices are quoted in US Dollars (USD) and may not include transportation, taxes, or other applicable charges. We offer a number of financing options with approved credit. If you are planning to use our financing services, please pre-qualify by calling us at 877.497.2552. Boat must be paid in full before delivery. All boats are charged a $399.00 administrative office paperwork fee, for Florida residents we also collect sales tax plus a $199.00 registration fee. For Miami residents, we collect a discretionary sales surtax of 1% on the first $5,000 of any boat purchase. Currency conversion is displayed for informational purposes only. Exchange rates can fluctuate hourly and rates for actual transactions may vary. Marine Connection Boat Sales, 5 out of 5 based on 488 ratings. Your email address has been added to the Marine Connection Inventory Updates newsletter. Your email address is currently subscribed to the Marine Connection Inventory Updates newsletter. Marine Collection is now Marine Connection of Miami! Marine Connection is proud to announce the acquisition of a well-known and respected dealer, Marine Collection. 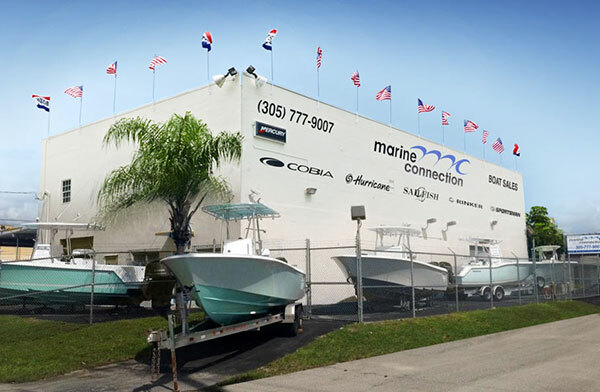 Marine Connection of Miami will serve our Miami customers with Boat Sales and Service. We are bringing our experience and reputation to the boating capital of the world, Miami. We have a beautiful indoor boat showroom and spacious outdoor display for the bigger boats. We welcome all of our existing and new customers to our new shop and hope to see you soon!